Today’s piece is a special commemorative finger rosary. 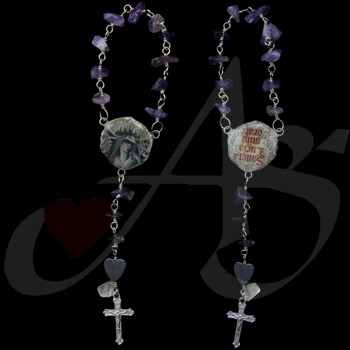 This finger rosary is made with amethyst stones, a hematite heart, and base metal crucifix, wired with nickel wire. The centerpiece of this finger rosary is St. Lucy, and the reverse side is written “Santa Lucia mihi orare”. Translated from Latin to English reads, “Saint Lucy, pray for me.” If you would like a similar piece of jewelry, or any of our unique pieces of art ware, contact us! Don’t forget to stop by our Facebook page, Google+ page, Twitter, Pinterest or our website for more amazing pieces of jewelry! … and we're back! Enjoy! :) Today’s piece is a special commemorative finger rosary. 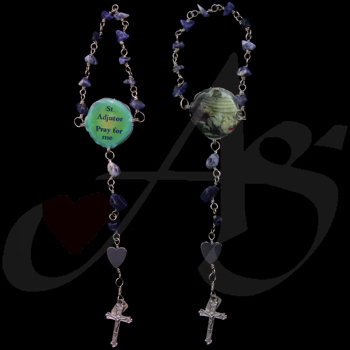 This finger rosary is made with lapis stones, a hematite heart, and base metal crucifix, wired with hypoallergenic nickel wire. The centerpiece of this finger rosary is St. Adjutor, the patron saint of swimmers. If you would like a similar piece of jewelry, or any of our unique pieces of art ware, contact us! 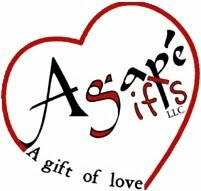 Don’t forget to stop by our Facebook page, Google+ page, Twitter, Pinterest or our website for more amazing pieces of jewelry!